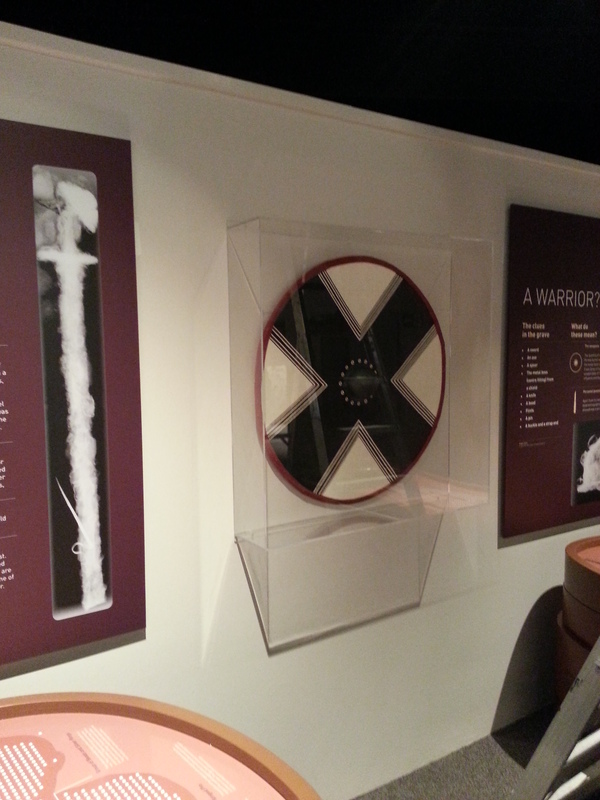 We have had a busy 12 months, finishing off some excellent projects, including the AHRC-funded ‘Bringing Vikings back to the East Midlands’ project by the Centre for the Study of the Viking Age at the University of Nottingham and a host of related events, and I shall update a post very soon with some images of this and other works we’ve been up to. I just wanted to take this opportunity to let you all know of an event we have organised at Repton in Derbyshire, which aught to be a lot of fun. If you are in the area, we’d love to see you there! I’ve had another busy year, with some very exciting projects, but the website is becoming quite difficult to keep up to date with all the current exciting work I am doing. At some point I will have to rebuild it, but for now I just thought I’d write a quick post to let you all know one of the best places you can keep up to date with the work we are doing and current projects and reproduction galleries; our social media. You can find links to our Facebook, Instagram, and Twitter on the left, but I would particularly direct you to Instagram to see the various stuff we have been involved in, and to Facebook for a gallery of curated projects here, particularly the museum and Universities handling collections in this album. We are currently working on a large reproduction handling collection for the AHRC-funded ‘Bringing Vikings back to the East Midlands’ project by the Centre for the Study of the Viking Age at the University of Nottingham. 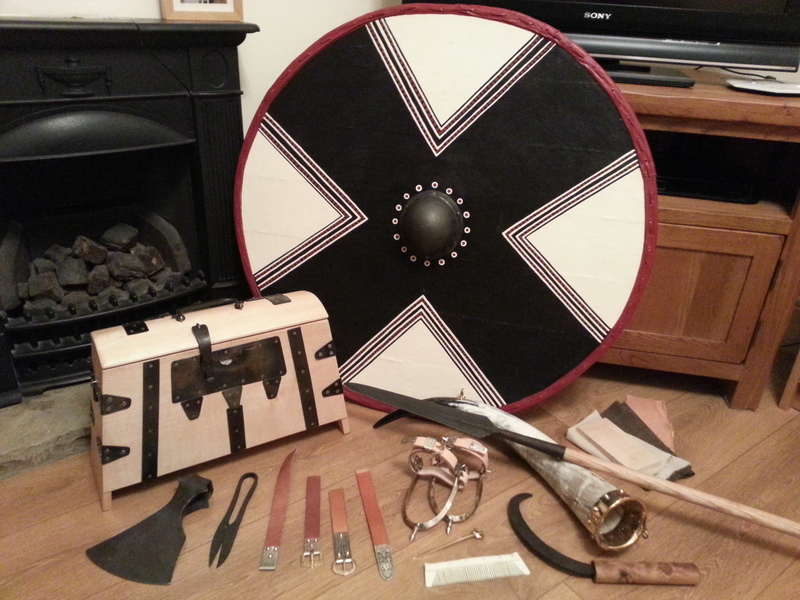 This will be completed in the next month, and accompany a large viking exhibition in the Museum of Archaeology at Nottingham Lakeside arts a series of handling and practical craft workshops. From the 27th June to the 2nd of July, I was privileged to be invited to attend the Viking World Conference 2016, hosted by the Centre for the Study of the Viking-age, at the University of Nottingham. As part of my invitation as well as being a full delegate at the plenary conference, I also would be manning a stall before and after lectures, and also during the breaks and lunch hour. 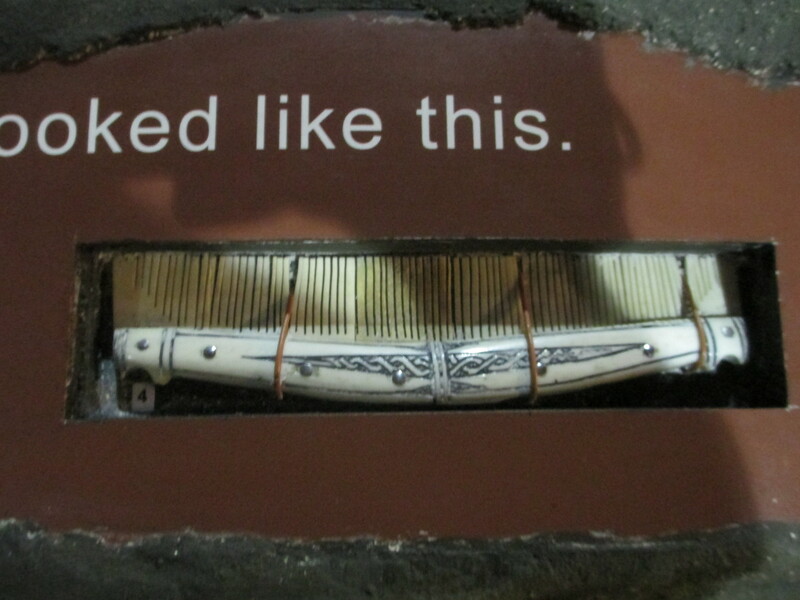 This would contain both reproductions of original objects I had made, as well as a small display on some of the experimental and investigative work I had done into craft techniques, and objects use and function. I have found previously that there is often a reluctance from professionals and academia to engage with a display such as this, particularly as until they spoke to me, most did not know I was also a professional within the field, however, whilst there was still a little of this, my overwhelming impression was that of interest, enthusiasm, and support, from the cast majority of delegates, often from places I was not expecting it. This is particularly the case from the conferences two organisers; Professor Judith Jesch and Associate Professor Christina Lee, who not only put in an amazing amount of effort to organise and run the conference, but also showed a lot of personal support and interest in the unusual work I do. Both brilliant scholars, and lovely people. The programme for the conference was very varied and wide-ranging, with speakers from all over the viking world, from the Americas to Azerbaijan. There are far too many topics to recount here, but you can see from the programme, just how much was covered. Things that stood out for me particularly were a talk by Charlotta Lindblom from Vejle Museum on the evolving story of the monumental landscape at Jelling; the sheer scale of the monuments was astounding to me. There were also a number of talks dealing with the local level networks of outland management by Andreas Hennius, who put forward the evidence for outland exploitation in the Viking-age, particularly tar pits, but which also got me thinking about other related industries, such as charcoal manufacture, honey and beeswax collection/farming, amongst many others. This notion of a complex and layered landscape exploitation tradition as part of a symbiotic relationship with larger towns and trading centres, made a lot of sense to me, and is a much neglected area of study. Ryan Fosters talk about Shieling naming in Northern Britain,brought out through the use of naming variations, a similar suggestion of a variation in activities and identities. In addition different talks by Vusala Afandiyeva, Þórir Hraundal, and Charlotte Hedenstierna-Jonson, really brought home the huge influence and activities of the Rus, both down the Rivers of Eastern Europe and modern-day Russia, and in around the Caspian Sea, and a compelling case for a more robust trade route to Asia. It is an aspect of Viking studies I had always been aware of but the scale and significance of it, I think, has really begun to emerge (like the Jelling monument) as far greater than previously appreciated. A subject very close to home was the talk from Eleanor Rye (from the University of Nottingham) who discussed placename construction in Cumbria and the Wirral, which owe a lot to West Norse influence, which reinforced my observations within my own field of interest; material culture, which I feel shows similar patterns. Kerstin Näverskölds talk on Shields as objects and symbols, and Leszek Gardeƚas discussion of pendants and amulaic objects in Poland, as symbols of belief and identity, brought home the nuance between a physical and functional object, and its personal significance and symbolism, and also a cautionary tale of how our beliefs and desire can taint identification and understanding of an object. I shall have to stop here, completely unfairly, because the temptation is to just run down the list of many outstanding papers given, some of personal pet subjects too, and this blog post would never end. Needless to say, it was an outstanding collection of work and material presented, and enough to overstimulated my brain even now, a week later! All in all, the conference, perhaps accented for me by the few talks I mentioned, brought home the scale and influence of the viking world, the significance and sophistication of its infrastructures and networks, and social systems, and the vast array of cultural variation and complexity of identities and belief structures. Diversity and Change indeed. Earlier on this year I completed the largest museum reproduction commission I have undertaken to date. 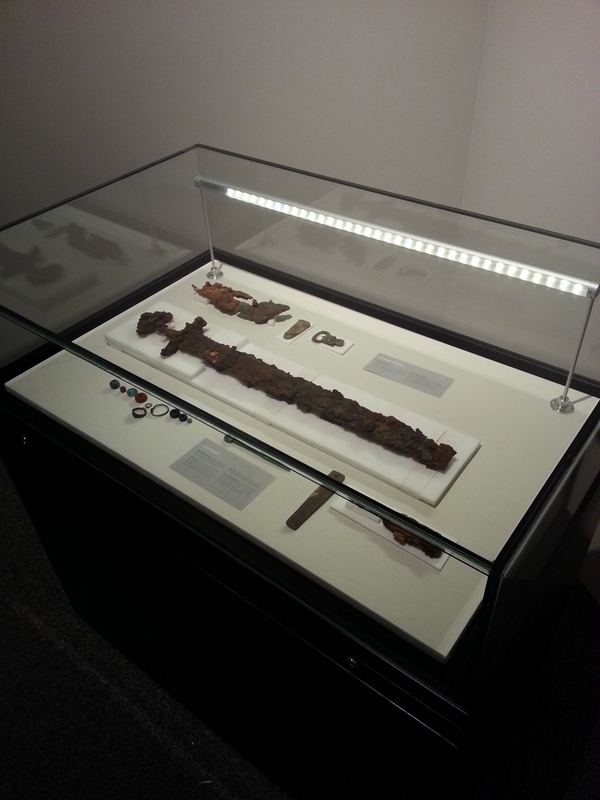 The work was outfitting Tullie House Museum and Art Gallery’s permanent new exhibition: Vikings Revealed, containing some of the material from the Viking-age cemetery at Cumwhitton, excavated in 2004. As one of the lead authors on the volume, I spent a good deal of time making reproductions during the analysis phase to understand some the artefacts better, and as such, understood a lot of detail about the objects and their manufacture. There were a lot of objects required replication, involving a huge variety of craft materials and techniques. 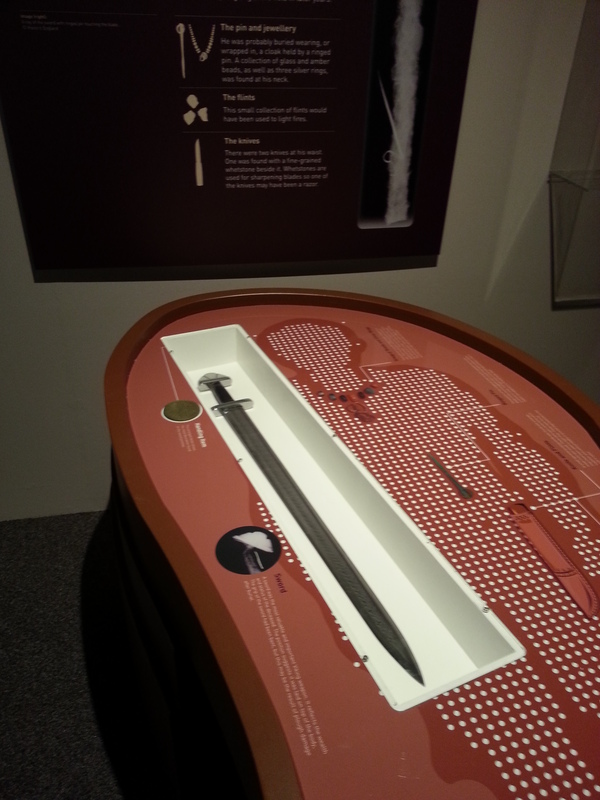 For the exhibition a Pattern welded sword with a silver inlaid hilt, a shield, and axe head, and a spear were chosen as reproduction weaponry. In addition, an iron bound maple box, a drinking horn with brass mounts, a pair of tinned spurs, with leathering and buckles, a ringed-pin, a pair of tinned brass buckles and strap ends, and a bone comb, sickle, and shears. Given time constrains, and the complexity and skill required in some of the weaponry, I enlisted the help of two friends; Dave Barnes a Blacksmith from York, and Paul Binns, a well-respected bladesmith. Dave did the axe, spearheads, and some of the ironwork, and Paul constructed the pattern welded blade. I made all the remaining items, and hafted the spearhead, and constructed the horn handle and hilts of the sword, and inlaid it in silver, the latter after some expert help and advice from a friend at Newcastle University. A group shot of all the objects. From left to right: axe head, iron bound maple box, the shield, shears, buckles and strap ends, spear, spurs, ringed-pin, comb, sickle, and drinking horn. 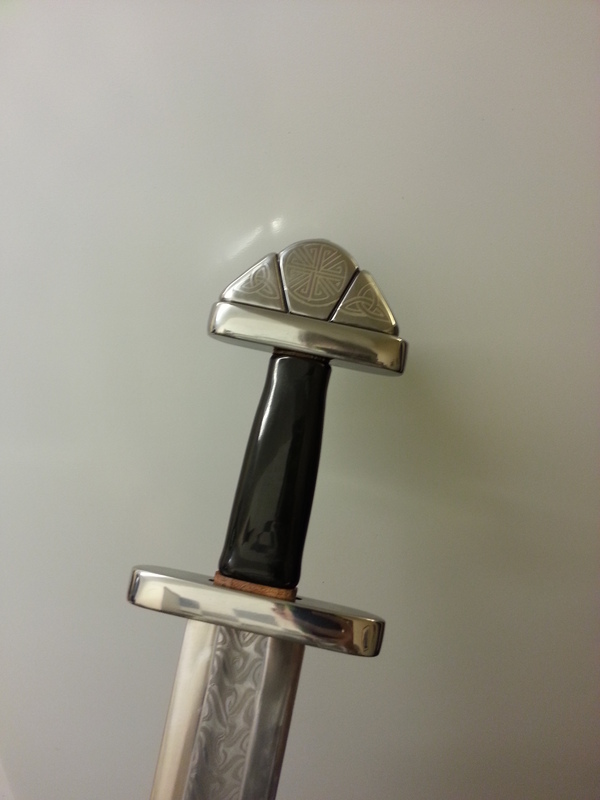 The Pattern welded sword, with a horn handle, and silver inlaid iron hilt. 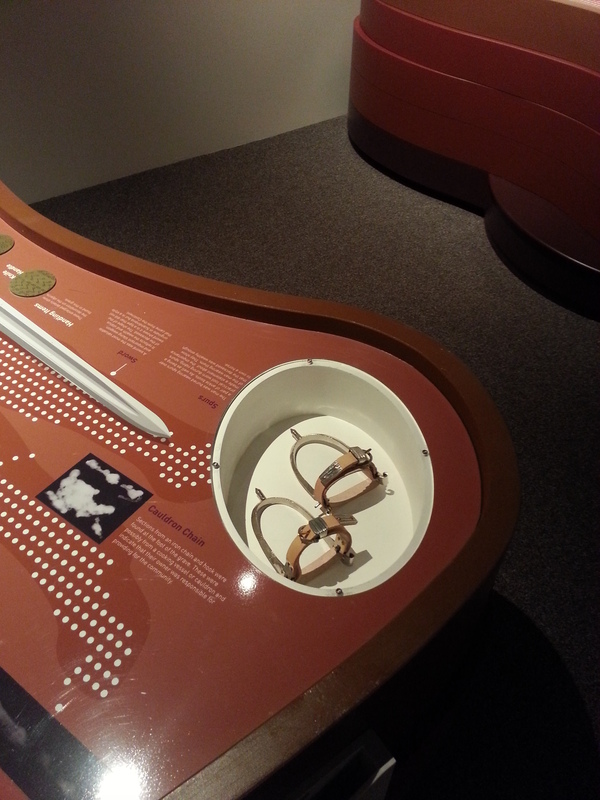 Finally I have a few pictures of the objects in the final exhibition, showing them mounted in the display cases. 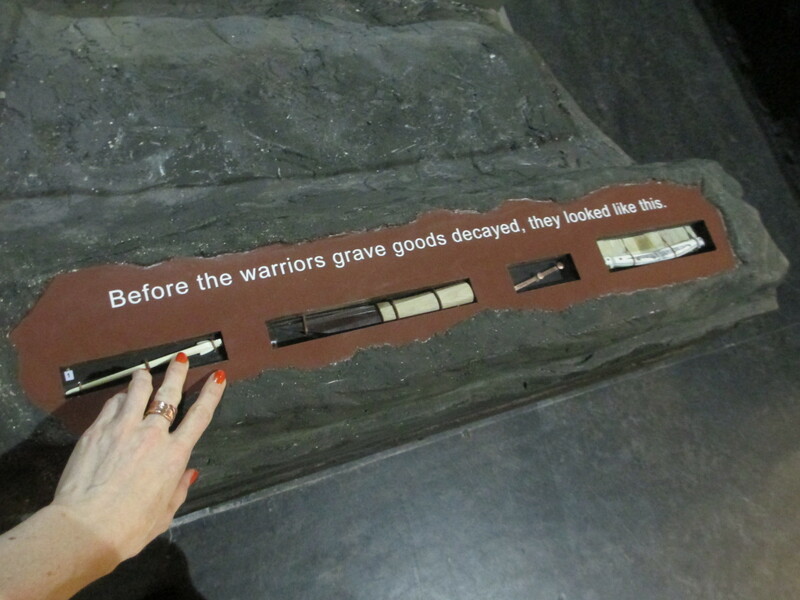 The majority of the objects were mounted within plinths to physically represent the graves, which the designers chose to embody the interred individuals, as their skeletons had degraded leaving nothing but their graves filled with objects. Last of all, here I am dressed as a 10th century viking, waiting to talk to the press and Tullie House members and VIPs for the open evening! It was a great opportunity to incorporate reproductions into an interpretations scheme, and whilst there is always more you wish you could do, they were a very striking and cost-effective addition to the exhibition. 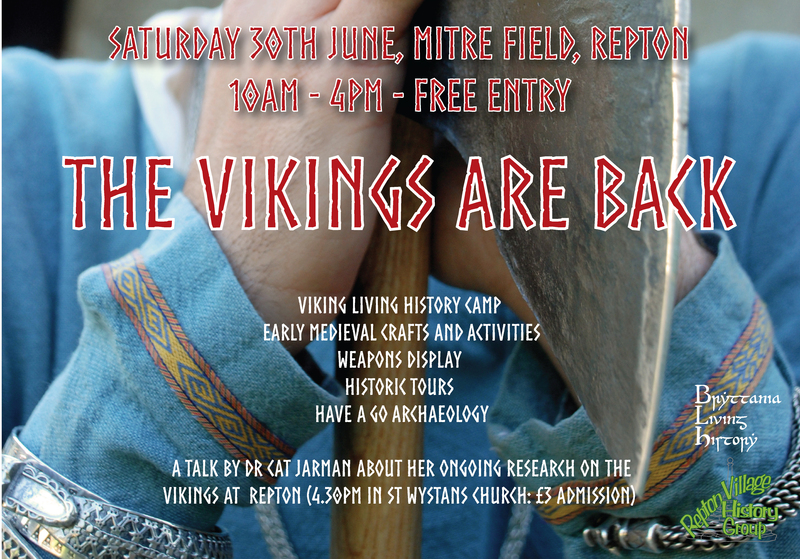 Tommorow myself and my wife will be heading off to Nottingham to attend the Midlands Viking Symposium on Saturday which I have been tweeting about for a while now! We have been asked to attend with some of the reproduction objects we have made to show during the breaks and talk to the attendees about how they were made. It should be a good event, and we look forward to hearing the lectures and chatting to folks about the work we do! Here are a few pictures of some of the new things I’ve been working on and will have for sale at the event! I have always loved beads, particularly Roman to Viking-age beads, but there are a couple of problems with them. As many interested in Costume and dress know, all too often they are associated with female dress; which means I rarely get to wear any, and secondly the making of them has always seemed a dark art to me, the way more complex crafts often do. Whilst I can’t do anything about the former, I can do something about that latter, so I booked some tuition time at the excellent Tillerman Beads with my wife and some friends. Mike and Su from Tillerman are known to pretty much everyone in Living History and Reenactment, and their reproduction beads are second to none. The research and experimentation that goes into Mikes beads is superb, and his understanding of how to recreate the varying forms and techniques, gives a phenomenal insight into the craft of bead making in the past. Indeed I have consulted his expertise in manufacturing on some archaeological finds I have worked on (you won’t find excess references to unnecessary marvering in my reports!). We were very lucky to have such a talent and resource to teach us, and as an ex-teacher, his tutelage was excellent too; my respect and thanks to them are considerable. We all had an enjoyable day and learned an awful lot, I can recommend it to anyone interested in crafts, and or history. Here are a few pictures of the work and progress I made throughout the day. One of the first usable beads I managed to produce! Finally Mike demonstrated how to make a unique kind of Hiberno-Norse bead, and are made in blue and white glass with occasional yellow dot decoration. They are primarily found in Dublin and may have been made there, but they also found in smaller numbers throughout the British Isles. These beads are really something special and I had to have a go. I was very pleased with the end result, and whilst still some way off Mikes beads, and the originals, I was very encouraged after a few hours to keep persevering in future. As a result, I have ordered some bead making equipment and will be practicing some more as it is a skill I would love to master. Hiberno-Norse beads are somewhat of an odditity in that they are quite a distinct design and colour palette. Indeed, so similar are many, that it is tought that they may well be from the same artist and/or their apprentices/offspring. There are some variants that seem to be stylistically a bit different, or perhaps cruder or in different glass, and these may well be copies by other artists, hoping to emulate these sought after items. They could also perhaps be variations by apprentices or offspring too. As mentioned above, they are primarily found in Dublin, alongside some arm rings, very similar to roman style ones, in the same colour scheme. 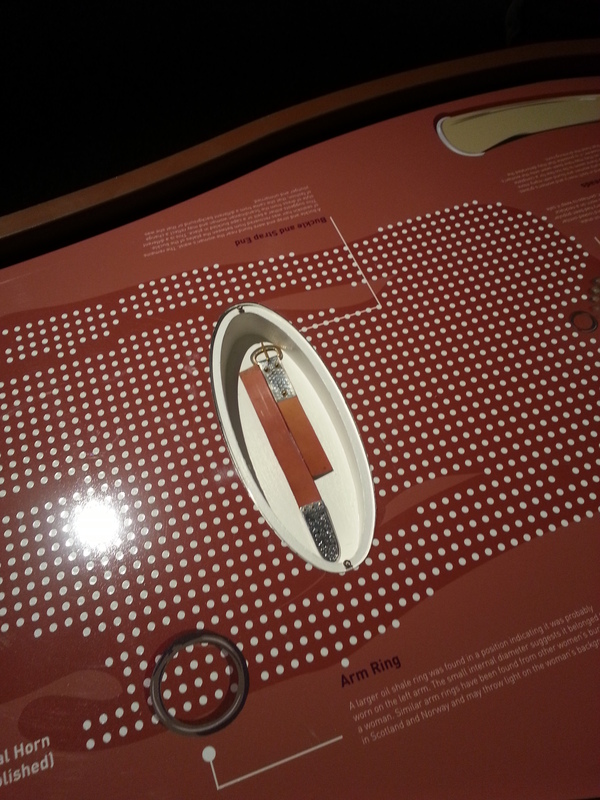 In addition, some of the ‘beads’ have multiple holes, and I suspect they may be strung together as part of more complex bracelets or necklaces (much like the romans did with segmented jet bracelets), or perhaps even some form of dividers for multiple swags of beads. They could even be decorations or guides for leather or cloth thongs on clothing or pouches. This bead style has also been found at other Viking-age graves and sites, such as Walmgate in York, Moan on Orkney, The recent Galloway hoard (although everyone is too interested in the silver to talk about the awesome beads! ), and other parts of Scotland to name but a few. There are also these examples from the British Museum. Hiberno-Norse beads, arm-ring fragment, and another ‘bracelet’ bead with three holes in the British Museum. The lower right example seems to be fo a different glass, and quality, and may point to the differences in manufacture, artist, or origin indicated above. It may seem like trying to master these as a starting point is jumping in at the deep end, but it is always the way I have learned arts and crafts I enjoy. Whether it be it wood carving, bone working, metal work, guitar playing, a real challenge has always proved to bring out the best in me, so there is probably little point changing now; wish me luck! 2015 was a busy year for me. 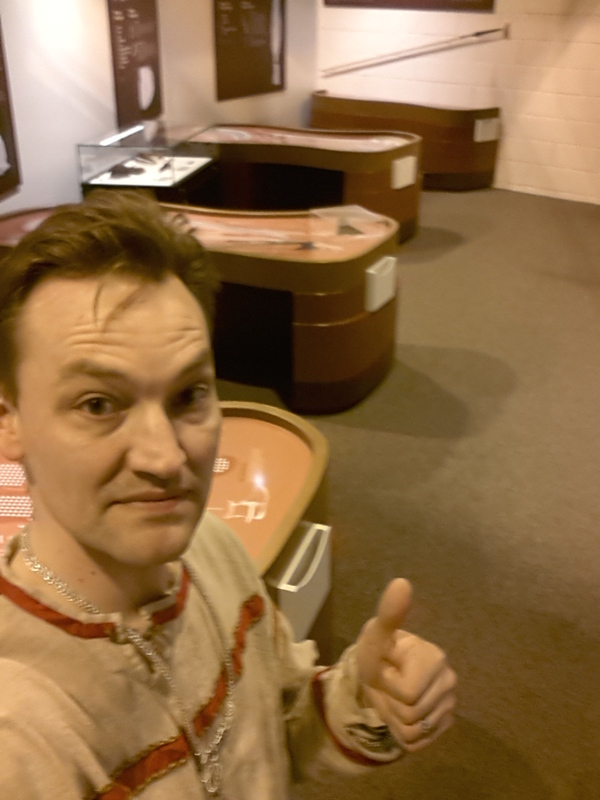 I got to meet some interesting people and was asked to undertake some interesting commissions throughout the year, the first of which came from the University of Nottingham’s CSVA (Centre for Study of the Viking Age) with an enquiry about some objects for their ‘Vikings for Schools‘ programme. As with most of the commissions I get, I spent some time with them, working out what sort of things they may need, and what they would need them for. As they are working with school children they needed to be very safe, and as robust as possible for frequent handling. In addition, there was a little working out of what sort of things might be useful, or possible, and working out a budget. In the end we came up with a list of Viking-age objects that I produced and delivered to the University Campus. Quite a lot of the creative and construction process I shared on my Twitter account: @eblueaxe and can still be seen there if you look back at my feed and images. 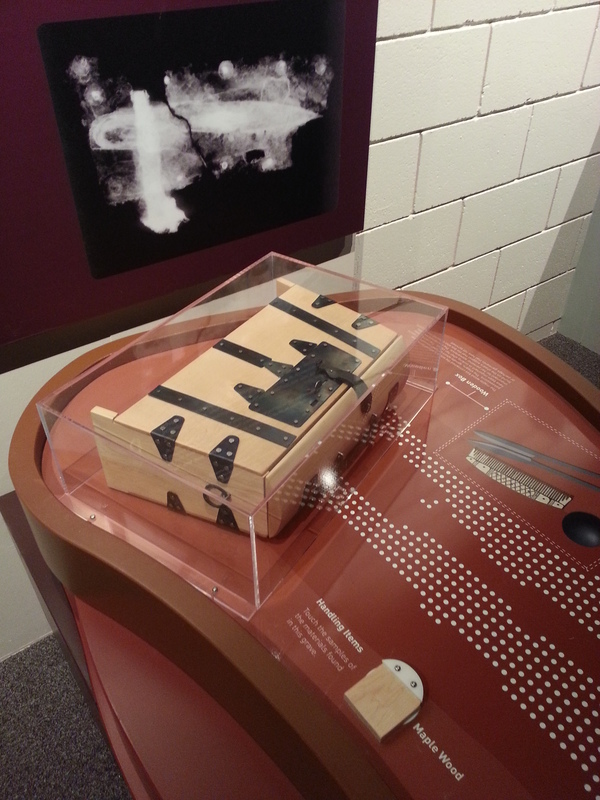 Below are the finished objects; including ice skates, a reproduction of the Lincoln runic comb and case, and the Scar viking boat burial comb, a knife with a wooden carved handle (based on a handle fragment from York), and a ‘carved’ leather scabbard. 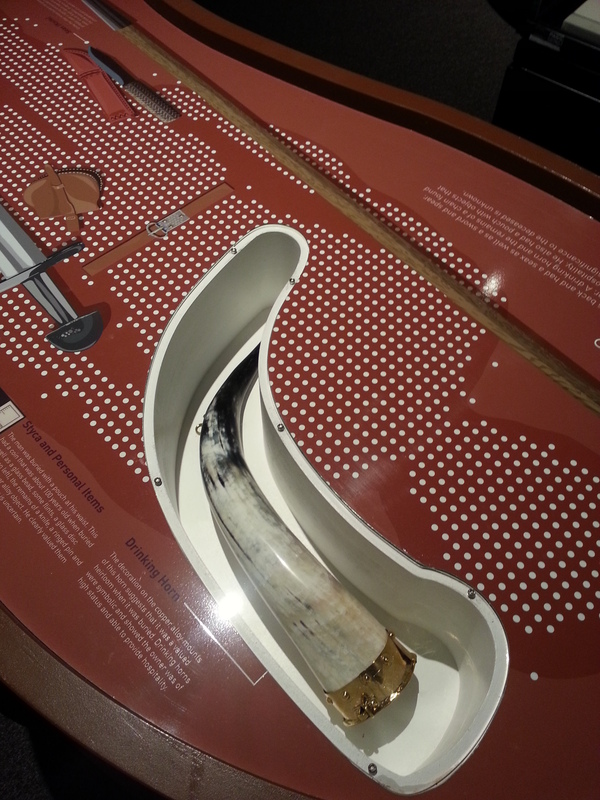 There was also a blowing horn and strap, four arm-rings based on finds from the Cuerdale and Silverdale hoards, and an early-eleventh century axe with an Ashwood haft and brass punched collar inspired by an example from the River Thames. Here is a picture of it all together, also including some of the bone Thor’s hammers and glass bead necklaces I made them. Last but by no means least, there was the small challenge of making an interpretation of a ships head with a dragon or beast on it. What size to make it, how to prop it up, and what to base it on were somewhat of a challenge as there is very little evidence as to what ship heads may have looked like, and a full size one or three dimensional version would be unwieldy and likely too expensive to produce, but it needed to maintain some of its scale and grandeur to impress the children. As a result, I decided to make it as a flat oak board that would be detachable from the front of the ship as suggested by some sources. For the design I chose to base it on one of the Gokstad ship burial objects carvings, as whilst it wasn’t a ship head, it was from a ship burial from the period, and was carved on a flat plank like this, and also importantly depicts some form of Horse, or Dragon, or other beast (notoriously viking snakes and dragons can have ears like horses which makes interpretation difficult!). Finally, a simple timber stand was constructed to hold the shiphead up higher and at the angle of the front of the ship. 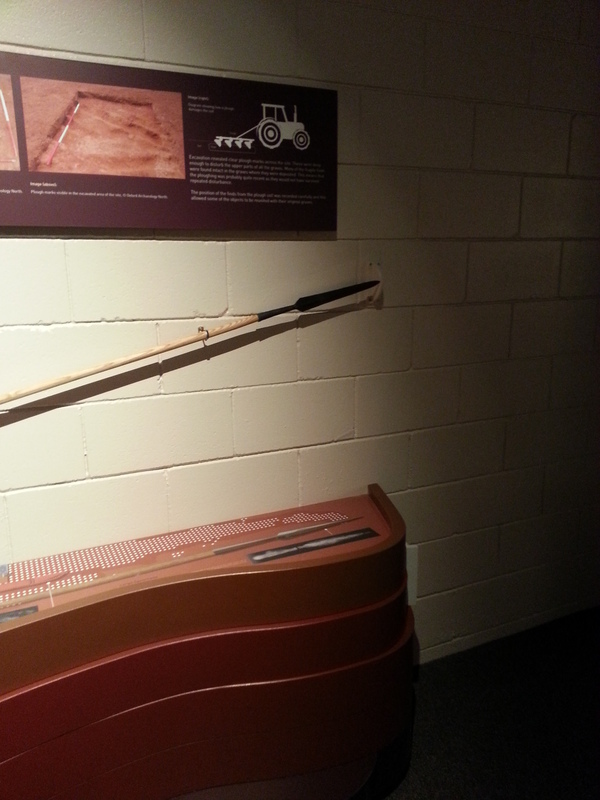 Finally here are a couple of pictures of the objects being used in anger, courtesy of the CSVA! Over the last 18 months we have a number of commissions from The National Trust, the Dublinia experience in Dublin, private individuals, Television production companies, and other museums and educational organisations. 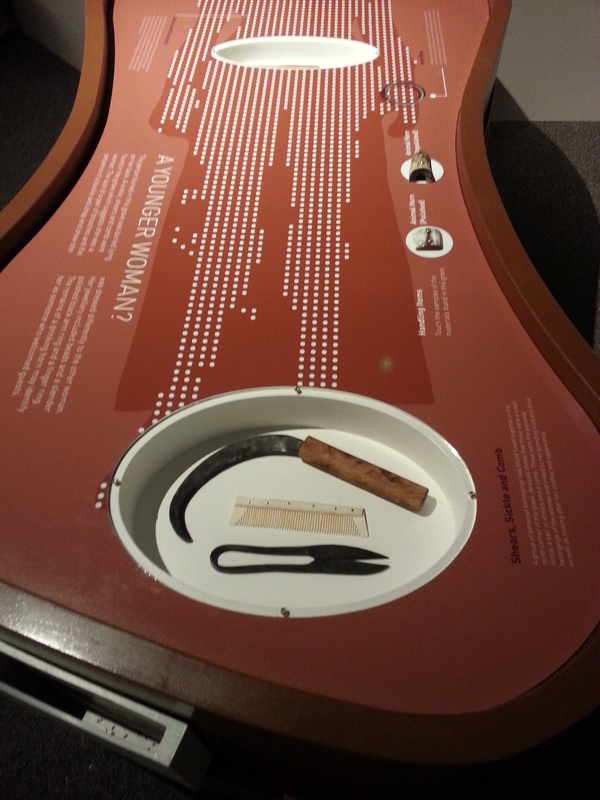 This has included an interesting mix of objects, from bone and antler combs (such as those below on display at Dublinia), tinned copper-alloy belt fittings, and copper-allow cloak pins. 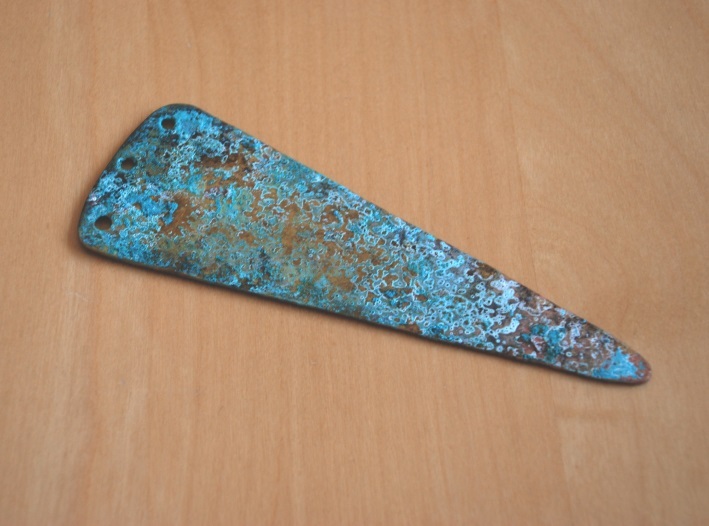 One of the more unusual items was a bronze age dagger ‘replica artefact’, complete with an aged patina. This was to be used for an archaeological dig exercise for children, to enable a number of school groups to excavate and analyse a mock-up bronze age grave many times. It has been an intriguing time, with a variety of interesting and unique challenges, so if you have one of your own please don’t hesitate to get in touch! Just to keep you all briefed, the site is not dead, the picture upload is just a little quiet at the moment whilst I work on some commissions, and some additional replica projects. Watch this space, and when new pictures arrive I’ll be sure to let you all know! Welcome to Blueaxe Reproductions. The site is still undergoing update and construction, and we are in the process of adding digital images of our products. It is taking some time resizing and uploading all the images, with the appropriate Archaeological and Historical information associated with it, so please check back soon, or send us an email at blueaxereproductions(at)gmail(dot)com (replace all the words in brackets with the appropriate keyboard symbols) if there is anything in particular you wish to see or ask about, or wish to place an order. 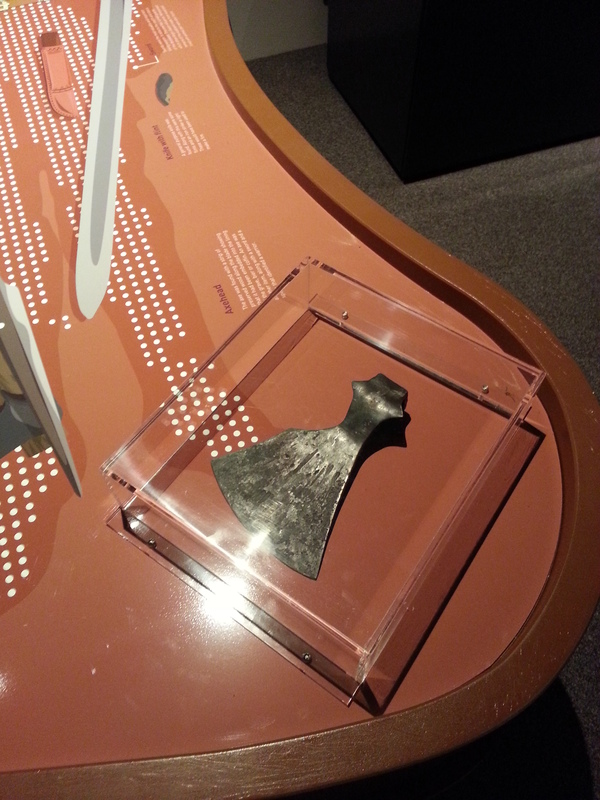 Blueaxe Reproductions produce affordable, high quality replicas of historical artefacts from a variety of periods. We prefer to work on commisions directly from the you; the customer, as this gives us a new challenge and means you get exactly what you want! We work in a variety of materials, and are always happy to discuss your needs and requirements in a no obligation and friendly fashion. We take all orders via email, so please just let us know what it is you want or need!